If you suffer a hip flexor injury, it means that the hip muscles responsible for helping you to bend over or to bring your knees up for jogging and climbing stairs have become strained. Hip flexor muscles include those at the top of your thighs and in your pelvic region. Repetitive motions like walking can cause hip pain, as can sudden motions that result in muscle tears. Severe tears may require surgery. But in most cases, less aggressive therapies, including home treatments, provide relief and healing for hip flexor pain. You don’t need professional equipment for basic hip flexor home treatment. But an inexpensive foam roller is often a useful addition to your post-workout and therapy arsenal. Foam rollers allow you to give yourself a deep tissue massage over wide areas. For hip flexor strain foam roller treatment, moving your upper thigh muscles over a large foam roller is the most direct way to release tension within the adjacent hip muscles. Start on your hands and knees. Then lower your body so that your braced arms take on most of the weight. Your left upper thigh rests on the foam roller, while your right leg is bent in a comfortable position on the floor. Begin to roll back and forth over the foam roller. Keep your left leg straight, with your foot touching the ground. Move your upper leg backward and forward, as well as slightly side to side, over the foam roller. Next, move the foam roller to your right upper thigh, and bend your left leg to one side. Repeat the process of rolling backward and forward, as well as side to side, over the foam roller. Gently stretching your hip muscles helps ease muscle tension. Hip flexor moves also build the flexibility you need to prevent future injuries. Start with a modified lunge. Get down on one knee with a towel under that knee for support. Your other knee will be bent in front of you so that your upper thigh is parallel to the floor. Tense your ab muscles and keep your back straight. Next, slowly lean forward onto that front leg until the back thigh begins to feel the stretch. This position can be held for 30 seconds before you switch your position to stretch the other leg. A butterfly stretch may also provide relief to sore hip muscles. Start in a modified cross-legged position on the floor, positioning the bottoms of your feet together, just in front of your pelvis. Gently press your knees toward the floor until you feel the stretch in your hips and thighs. Hold the position for about 30 seconds; then release. Repeat two or three times. Ice remains one of the most efficient home remedies for a hip flexor strain, among other aches and pains. In the first few days after a hip flexor injury or when you first start noticing pain, apply ice packs for about 15 minutes at a time a few times a day. After the first few days, begin alternating cold pack applications with some form of heat treatment. Heat therapy can take the form of heating pads, warm showers or washcloths soaked in hot water and wrung out. If your heating pad has both a dry and moist setting, choose the moist setting to help the heat penetrate better. When it comes to over-the-counter oral medication, select a type that not only offers pain relief, but also reduces swelling. This class of anti-inflammatory painkillers includes ibuprofen, acetaminophen and naproxen. Be sure not to exceed the recommended dosage. If the pain in your hip muscles is severe or doesn't abate with home therapies, see your doctor. She may recommend physical therapy. 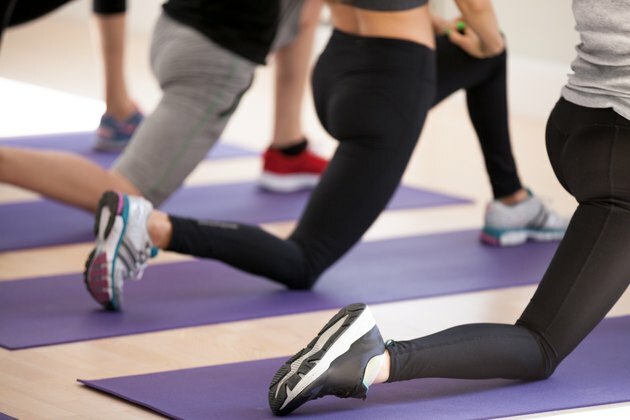 A physical therapist can not only evaluate the hip flexor injury, but also supervise your stretching techniques and offer new moves. Other healing aspects of physical therapy include targeted massage and heat and cold treatments. In addition, your doctor may also suggest at least one hip joint injection. Doctors typically combine a short-term numbing agent for immediate relief with cortisone. Cortisone eases swelling and provides longer-lasting pain management.